Voting is now open in the 2014 Edublog Awards! This is the second year in a row where we have leveraged public voting using List.ly. That’s it! If you aren’t already logged in to list.ly, you can do so using a facebook, twitter, LinkedIn, or Google+ account. Can you vote once per day, or just once during the entire voting period? Thanks! Hi Ronnie! 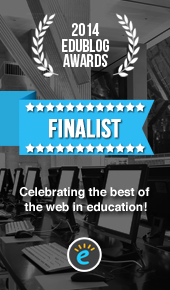 Fantastic to be in the final of Best educational use of media (audio, video, podcast, etc.)!! Is it possible to change the wording ‘Pivotal Education Blog’ to ‘Pivotal Podcast from Pivotal Education’ please? The blog is actually a different thing! Also, there is a nice podcast icon – would it be possible to change the QR code to the icon please? Thanks so much! Hi Kevin – sure thing – that should now be done 🙂 Thanks!